A beanpole hailing from Melbourne’s outer eastern suburbs, Richards was a huge tap ruckman who showed flickers of promise but could never nail down a permanent place in the senior side. 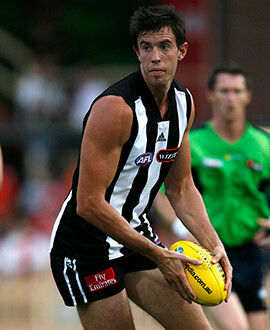 Tipped by some to be taken in the top 10 of the 2000 National Draft, Richards always loomed as a long-term project. He was struck in the kidneys while playing for Williamstown in his first season on the list, and an x-ray revealed a congenital problem. He was a fine tap ruckman and by 2004 had developed the confidence to crash into the packs. He debuted alongside Tom Davidson and Bo Nixon in the win over the Bulldogs in round two, 2004, and by mid-season had evolved into arguably the club’s most exciting young prospect. A Rising Star nomination came his way after a fine performance against Adelaide in round nine, but injuries sidelined him after the mid-season trip to Sydney. Knee and hip problems in 2005 meant he did not play a senior game until the final fortnight, and he began 2006 as a handy back-up to Josh Fraser, polling his only Brownlow vote against Hawthorn’s Peter Everitt in round two. He lost his place five games into the year but returned in time for the Elimination Final loss to the Bulldogs. Richards played 16 of a possible 25 games in 2007, growing in confidence as the year progressed. He put in a career-best performance in the ruck against Everitt (who was now playing for Sydney) in round 21 and followed it up with another strong showing against the same opponent in the Elimination Final. With Fraser withdrawing with injury at the final hour, Richards and fellow ruck back-up Chris Bryan had to shoulder the load against the might of Dean Cox in the famous Semi-Final against West Coast. He provided a solid contest, winning 17 hitouts in the extra-time triumph. Richards battled against Geelong’s Brad Ottens in the epic Preliminary Final loss the following Friday and was delisted at season’s end.